In Ke'ehi Lagoon, between Honolulu Harbor and the International Airport, less than half a mile from the bustling metropolis of downtown Honolulu, lies the small 10-acre Mokauea Island. Mokauea Island is the site of O'ahu's last Hawaiian fishing village, and one of the only two left in Hawai'i where hundreds such villages thrived in pre-European times. These villages were a repository of an impressive and significant body of maritime skills; knowledge of the sea, currents, tides, seasonalities, the building and handling of finely crafted canoes and fishing equipment. Much of he knowledge and skills of our pre-European coastal Hawaiian fishing villages have been lost in the past century. 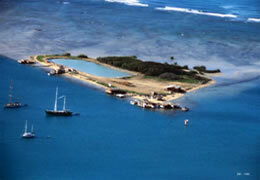 Mokauea Fishing Village, being the last of its kind, is unique in its historical, social, and educational value. Since 2005, Kai Makana has been leading an effort to environmentally and culturally restore Mokauea Island. Adopting the vision of the Mokauea fishermen, our goal is re-create a living example of a traditional Hawaiian subsistence fishing village. The fishing village at Mokauea will be a learning center that will allow for scientific studies and the perpetuation and practice of Hawaiian fishing and seafaring culture. 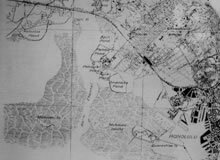 Maps dating as far back as 1817 show the fishing village at Mokauea Island. At one time, the Ke'ehi Lagoon region was the home to as many as 41 fishponds that were eventually destroyed by dredging and development. The island's fishing community has cultural roots and heritage that are believed to have extended to pre-historic times. Mokauea Island was once entirely self-sufficient due to a functional fishpond, cultivation of vegetable and medicinal plants, as well as limu (seaweed). And the surrounding area had a healthy supply of reef fish. This was an island that needed nothing more than a consistent environment and respect from others. 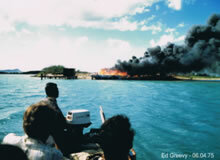 In 1972 the State attempted to evict the fishermen from Mokauea and the families were ordered off the island. Several fishermen were arrested for trespassing on land their families had lived on for generations. In June of 1975, in a final eviction attempt, the State burned down 5 fishermen's homes. In response to these acts, the fishermen, with the help of John Kelly and his non-profit Save our Surf, organized the Mokauea Fishermen's Association (MFA). Subsequently, a formal historical study by the State Historic Preservation Office concluded that Mokauea was "an era of important historical concern." The fishermen and their families rebuilt their homes, and the MFA began their work restoring and reviving the fishing village with the cooperation of the Army and groups of students, teachers, scholars, and scientists. Over the last 30+ years, some progress towards creating an educational center was made on the island. But with a swing in politics in the 1990's and changing island family dynamics, participation in restoration efforts on Mokauea Island came to a near halt. Kai Makana is now leading the restoration efforts originally proposed by the MFA. 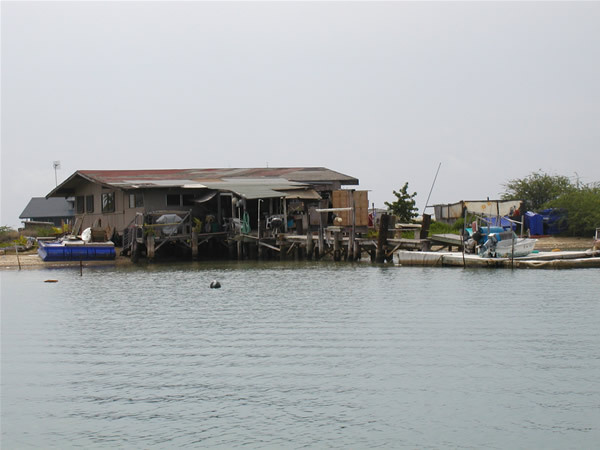 We are encouraged that our current efforts now involve a diverse collection of community members, private business, and government agencies, who share an interest in preserving the unique Hawaiian fishing village lifestyle on Mokauea. 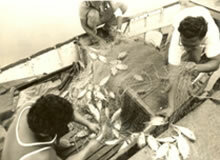 In 1975, the Mokauea Fishermen's Association decided to expand the 300 sq. ft. fishpond that already existed on the island as part of their plans for the restoration of the Hawaiian fishing village on Mokauea. With the help of the US Army Corps of Engineers and Save our Surf, the expanded pond was completed in 1980 with a new 'auwai (channel) and makaha (gate). Over the next 30 years, the fishpond faced challenges ranging from invasive species to pollution and was ultimately abandoned. In 2005 Kai Makana found the two-acre fishpond unused, overgrown with mangrove, and shallow due to sedimentation. Additionally, an invasive algae known as "gorilla ogo" (gracilaria salocornia) has infested the pond. Over the past year volunteers have been working hard to remove the mangrove and algae. Once cleared of these invasive species, the pond will be deepened, the 'auwai repaired, and the makaha replaced before we begin to reintroduce fish and native limu. Marine debris has serious effects on the marine environment, marine wildlife, the economy and human health and safety. In fact, marine debris has become one of the most widespread pollution problems facing the world's oceans. Volunteers regularly pick-up and dispose of marine debris and trash that are carried to Mokauea Island by the ocean tides. Plastic bags, broken glass, old TVs, bike parts, cans, bottles, nets, and other debris all make their way to the island. 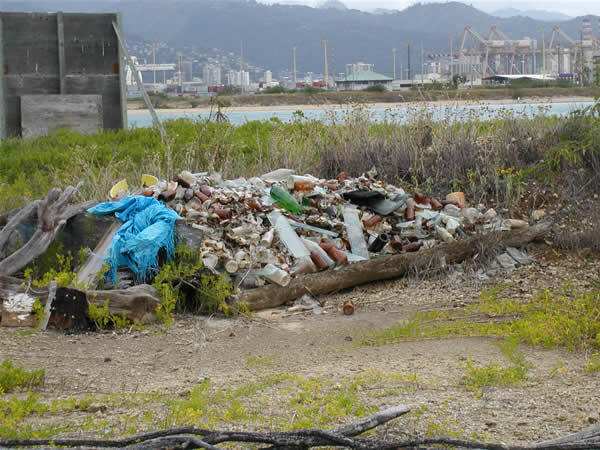 In celebration of Earth Day in April of 2008, the US Army assisted with the removal of over 20 years of marine debris that its way to Mokauea with the current and tides. The soldiers and their heavy machinery hauled away large items like derelict boats, parts of furniture, and a large pile of debris that had been collected by volunteers. The following day, more than 300 volunteers helped to manually clean-up and dispose of an additional 2-1/2 tons of marine debris collected from the Mokauea's shores. Considering that only 4 families reside at Mokauea, it is easy to see the impact our trash has on others. Mokauea is overgrown with red mangrove, pickleweed, and long thorn kiawe (LTK). LTK is a designated noxious weed and has thorns which can grow up to three inches in length. Removal of the LTK form the island continues to be a significant challenge for the project. We are also attempting to eradicate the mangrove from the fishpond and contain the mangrove forest at the south end of the island. Pickleweed is being removed in section and replaced with native plants. Test plots have been started by a class from Farrington High School to see which native plants are most suitable for Mokauea. The students bring native plants from their school nursery and are responsible for caring for their plots and monitoring progress. Our plan is to restore the botany of Mokauea with native species, one section at a time. During the clean-up debris in Mokauea Island a few days after the DOT burned down five fishermen's dwellings on June 6, 1975 in an abortive eviction attempt, an old cane was discovered. The canoe is in an unfinished state of construction. It is 22-feet long, 22-inches wide, and 22-inches deep. It was carved form a solid koa log in the old Hawaiian style of canoe making. The gunwales, interior, and exterior clearly show tool marks of old Hawaiian adzes of the type on display at the Bishop Museum, or possibly adzes with metal heads - in either case, adzes of the type used in canoe making prior to the 1900's. The canoe shows no saw tooth marks anywhere. Timber saws generally had replace adzes and axes for tree felling at or before the turn of this century (1900's). The pepeiao (seat supports) are carved as a part of the solid koa huli, a practice that ceased about a century ago. The canoe has "V" bottom indicating it was designed for sailing. This canoe was carefully examined in July 1975 by Dr. Kenneth Emory, a leading senior anthropologist of the Bishop Museum; Herbert Kane, expert in Pacific canoes; and Wallace Froiseth, well known canoe restorer and founder of the Waikiki Canoe Club. Because of the koa log construction, its unfinished state - which reveals techniques of workmanship - its "V" bottom, it is regarded by these experts as genuine Hawaiian fishing village artifact, "one-of-its-kind anywhere" (Emory), "a priceless antique at least 100 years old" (Kane), and "a real find - a beauty" (Froiseth). Kane considered the question of whether the canoe could have been sailed to Mokauea and left there. He ruled out this possibility since the canoe was without outrigger and not finished sufficiently to be navigable. 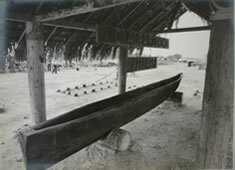 Kane said this type of canoe was used as a near shore fishing canoe, suitable for expeditions of a few days. Old-time Mokauea fisherman Joseph Kuhiiki (Mokauea resident since 1924) remembers his children finding this canoe in the Mokauea mangrove forest a few years ago, dragging it out and playing with it for a while. The fires set by the state's agents on June 6th came within a fe feet of destroying this invaluable artifact. When the Mokauea issue was widely publicized by the media in April through September 1975, an unsolicited letter appeared in the Honolulu Advertiser on July 16, 1975, signed by Robert Rothwell. Rothwell was a former corporation counsel for the City & County of Honolulu. Rothwell dismissed as false the contention by the state DOT director at the time Mokauea Island was an artificial island made in the 1941 dredging in Ke'ehi Lagoon. Rothwell describes in the letter a visit by his father, Guy Roswell, the late noted architect and marine expert, to Mokauea in 1907 to consult with an expert Hawaiian canoe make who lived there. This was in connection with two canoe Guy Rothwell was preparing for the 1908 Seattle World Fair. 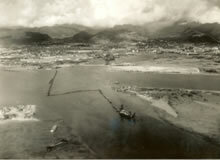 He photographed the old Hawaiian canoe maker, a canoe he was working on, and in the background, the Mokauea Fishing Village. 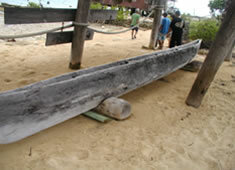 Kai Makana began its volunteer efforts on Mokauea on 2005, the canoe was badly damaged on one side of the hull, exposed to the elements - the halau built for it was dilapidated and falling to the ground. The Mokauea Fisherman's Association has asked for Kai Makana's assistance in finding a safe place to store the canoe until the restoration work on the canoe is finished and a safe place for it has been established back on Mokauea. Kai Makana is raising funs to restore the canoe and construct a new halau to house it. 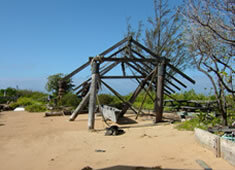 The halau would also provide shelter for volunteers and contain a fishing museum. Check out our calendar of events and join us on one of our community work-days. If you would like to join a service project, please contact Kahaulani Kupihea at mokauea@gmail.com. From Nimitz Highway, take Sand Island Access Road until you pass some large storage tanks (on your right side). Go over the bridge and make your first RIGHT onto a small paved road. Follow the road as it makes a sharp right and go all the way down until you see a parking lot. There will probably be cars parked alongside the road. Look for a single vehicle parking spaces - you cannot park in the long spaces that are reserved for vehicles with boat trailers. If there are no single spaces available, you must parallel park alongside the entrance road. There is a restroom building on one side of the parking lot. Look for the lineup of outrigger canoes near the water - we will meet near the canoes. Sun protection, hats or visors, slippers, crocs or old tennis shoes, tabis for working in the fishpond, wear cloths that you don't mind getting wet, a bottle of water (we have jugs to refill), and the signed Kai Makana waiver (for first timers). Kai Makana is an all volunteer 501(c)3 not-for-profit organization. All donations go directly to the project.